We missed the first Concept Haulers race because of previous commitments and second race was rained(snowed) out. After a year since the last sprint race, Wild Duck Racing has returned the sprint track with Concept Haulers race #3. We are just about the best prepared we have ever been with two practice sessions and proper time spent reviewing notes and doing kart setup. The only thing holding us back is the lost time of being away. Being a one day race we traveled light with just the kart, tools, and a few other necessities packed into the truck much like our early days in kid karts, although we did forget cleaners and lubricants. 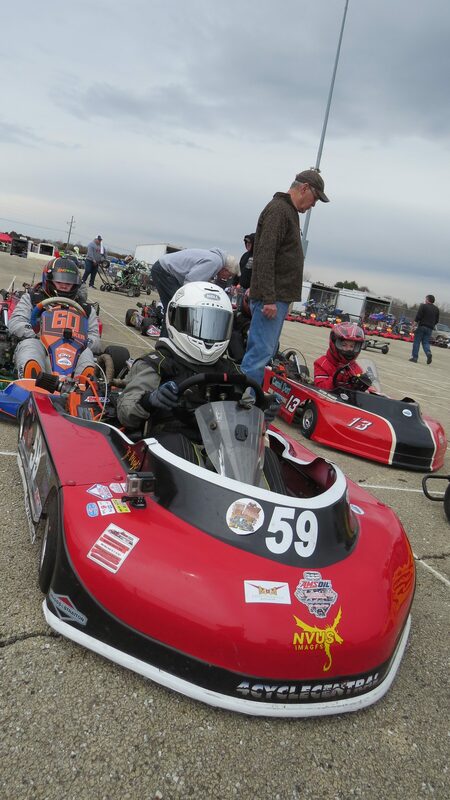 The last sprint race Jason ran was in April of 2017 at 61 Kart-away and before that he was a sportsman. Both of us needed to start over. He is driving a new kart, a 2015 Coyote Wide Track, and it is still very much a mystery. Now we are and need to study and pay attention to every little thing. Jason started heat 1 mid pack and finished there he passed the slower karts and the faster karts passed him. In heat 2 he started in the back and picked his way to mid-pack. The feature race was pretty good race for 4-5-6 and some good practice with pushing and drafting and he finished 5th of 8. He was 3 second off from the leaders pace which was blazing compared to everyone else. Just being on the track again was enough, we now know where we stand now and what its going to take to be competitive again. Instead of heading home after racing got a hotel room and hung out with some kart friends and relaxed. Sunday, we were back at the track for some practice. Spent all afternoon testing, tuning, and practicing. By the end of the day, Jason and the kart were moving a bit faster, but, there is still lots of work to do. We are very likely to do the race and practice again next weekend.